Chinese Chicken Stir-Fry....Using the Water Velveting Technique...I recently came across a technique which "tenderizes" meat. This particular technique is called "velveting"... a process used in Chinese stir-fries. I had never heard of it before until I came across it on BigOven. I thought it was really neat...actually, I was fascinated with the idea. This velveting process gives meat a smooth, velvety coating. It also helps keep the meat from drying out... making the meat juicy and tender. I don't really think it tenderizes the meat, but it sure makes the meat nice and soft. Sometimes, I really crave Chinese food.... I 've often wondered how the Chinese restaurants got their meat to be so soft and velvety. For some reason, I always thought they used some sort of tenderizer. I guess I was wrong...ok, maybe some do use a tenderizer. I really don't know. But I like this method.... am happy that I have finally found a way to duplicate it at home with wonderful results. Velveting can be done in 2 different ways...using the oil method or the water method. The meat is first marinated and allowed to sit for 30 minutes and then either cooked in oil or water until the chicken turns white or is about 90% cooked. It is important to know that if the oil technique is used, the chicken cannot be refrigerated for later use. Refrigeration will toughen the chicken...and not become tender. But if the water method is used, the chicken can be refrigerated. For this post, I chose to do the water technique. It is easier and I don't have to use too much oil. What I really, really like about the velveting technique: You can velvet the meat in advance and finish it off later. For example, you can velvet the chicken in the morning and have it ready for dinner. Simplifies the meal in 3 easy steps. 3) Add sauce and nuts(if using) cook till thickened. Done. Simple and good! You can use the velveting method with all sorts of meat...beef, chicken, shrimp, pork, etc. Also, feel free to use all sorts of sauces....kung pao, stir-fry sauce, hoisin, plum sauce, black bean, sweet and sour, etc. Here is a simple homemade sauce( for 1 lb of meat)...that could probably be doubled. It could even be thickened a bit with cornstarch slurry. I thickened mine a tad bit...just enough to coat the chicken and vegetables. You might not need to...depending on what vegetables/sauce you use. Adjust seasoning to your taste...you can even add some sesame oil. Cut the chicken either in cubes or strips. Place in a container. 1. Sprinkle in the salt while stirring the meat. 2. Stir in the sherry. 3. 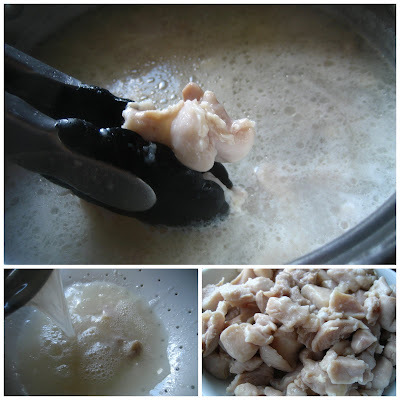 Add the egg white and gently mix to coat each piece of chicken making sure not to froth the egg. 4. Sprinkle in the cornstarch, coating each piece. 5. Add the oil and stir to coat. Let the meat marinate for 30 minutes. 1. In a small bowl, mix together all of the ingredients for the sauce and set it aside. 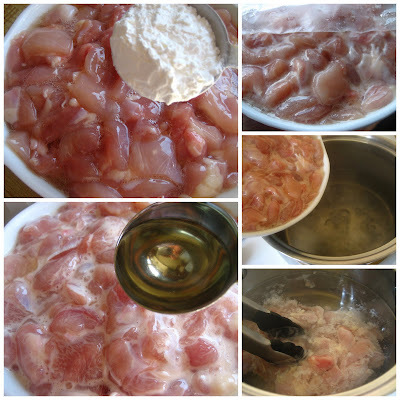 Velveting the chicken: Using the water method. Once the chicken has marinated, cook it using the boiling method of the velveting process. 1.Start this process by bringing a pot of water with just one tablespoon of the peanut oil to a boil. 2. Once the water boils, lower the heat to maintain a very gentle simmer. Scatter in the chicken, stir to separate and keep stirring gently until the coating turns white. This should take less than a minute. 4. The chicken can be refrigerated( or even frozen...though I haven't done that) for use later. Get your ingredients ready...this always makes things go much smoother. 1. Heat a non-stick skillet or wok on high. Add a tablespoon(or 2) of oil(can use coconut oil) and let it get hot. 2. Once the oil is hot, add the garlic and ginger. 3. Stir fry just until it is light brown, about one minute....make sure you watch it as it can burn rather quickly. 4. Add the vegetables(if using) along with the velveted chicken. Stir fry for just 1 more minute or so. 5. Then add the sauce(whatever you like to use; store-bought or homemade) and cook for another 2 minutes or so, stirring until the vegetables and chicken are coated with the sauce. If you notice that your sauce is not thick enough, you might need to add a bit(not too much) of a cornstarch slurry to thicken it. 6. 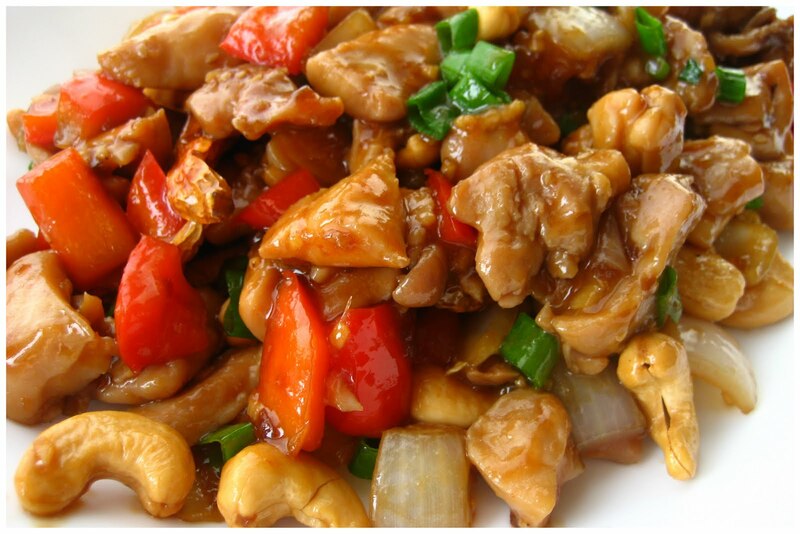 Add nuts(peanuts or cashews, if using) and green onion. Toss to mix. 7. Top with sesame seeds if you like. 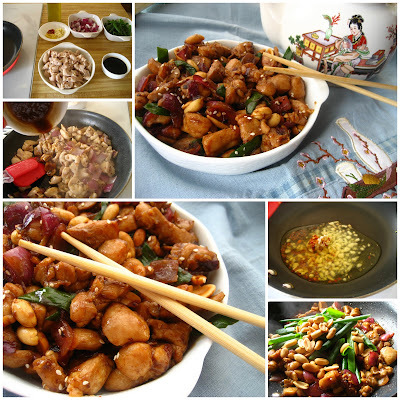 In the above pictures, I used garlic, ginger, red onion, chile flakes, peanuts and green onion.... and the homemade sauce. In the above photo series, I used whole garlic, ginger, whole chiles, red bell pepper, white onion, cashews and a sprinkle of chopped green onion....and a store bought sauce and a bit of cornstarch slurry. You are a genius! 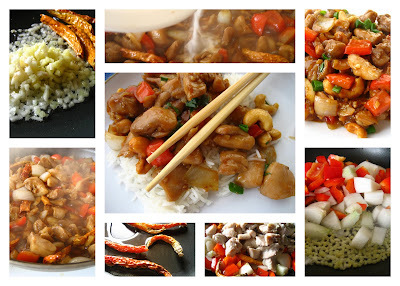 All of those dishes look amazing and just like the Chinese restaurant :) I can't wait to try this method myself. thank you so much for sharing this with us!!! Arata minunat !mereu ma suprinzi cu retete interesante ! Andrea...Thanks for stopping by. I wish I had come up with the idea...but am really glad I came across this type of method. Sure makes Chinese cooking much simpler! My family used to own a Chinese Takeout and that's how my papa cooks meat. I always assumed he was just precooking it so that it would be faster when people ordered it, but looking at your post it seems that he was velveting. Isn't it funny that I'm learning this from your blog instead of from my father? Budafist, So glad you stopped by.... Yes, this method also allows the food to be cooked-to-order... ensuring you get a hot sizzling plate and nice velvety meat:). Andrea, I really appreciate you taking the time to write and share your feedback. It really makes my day when someone else tries a recipe and likes it just as much as we do:)....So, thank you. Just finished dinner. Made the velvet chicken and put it with celery and cashews in a brown garlic sauce. My husband loved it and my young son thought the chicken was too tender! Thank you for the blog you made it very easy. P.
Anon, That's wonderful! So glad you tried it and that it was a success for you.... and that the family liked it. I so appreciate you taking the time to stop by and share your feedback. Glad I could be of help:)... makes my day when someone enjoys a recipe I've posted. Could you please explain why refrigerating after will harden the chicken when using the oil velveting method as oppose to the water velveting method? Hi, I have tried this couple of times and its a big hit already with my family. The only issue is the carb content of velveted chicken. Can I replace the cornstarch with something else. Can only egg whites work or do we absolutely need to add cornstarch? Anon, I am glad you've enjoyed the recipe. As for substituting the cornstarch for something else that has no carbs is quite difficult. The cornstarch does have a role in sealing in and keeping the meat moist. I'm not sure if the egg white only will help... because the cornstarch helps the egg to cling to the meat and provides that layer of protection. You might want to skip the velveting altogether, if you don't want the additional carbs. I've heard of adding baking soda to achieve a tenderness in the chicken similar to velveting...you wash the baking soda away before cooking... it might be worth trying. Hope that helps.... and thanks for sharing. Can this recipe be doubled, tripled, quadrupled, etc. or should I cook it 1 pound at a time? Anon, I don't see why you couldn't double it. Should work just as well. Hope that helps... and enjoy!